Even though this is a thoroughbred website, we thought you’d like to see what the Virginia Equine Alliance and Virginia Harness Horsemen’s Association are doing up in Woodstock, Virginia at the Shenandoah County Fairgrounds. We hope to see many industry participants at the fall meet! 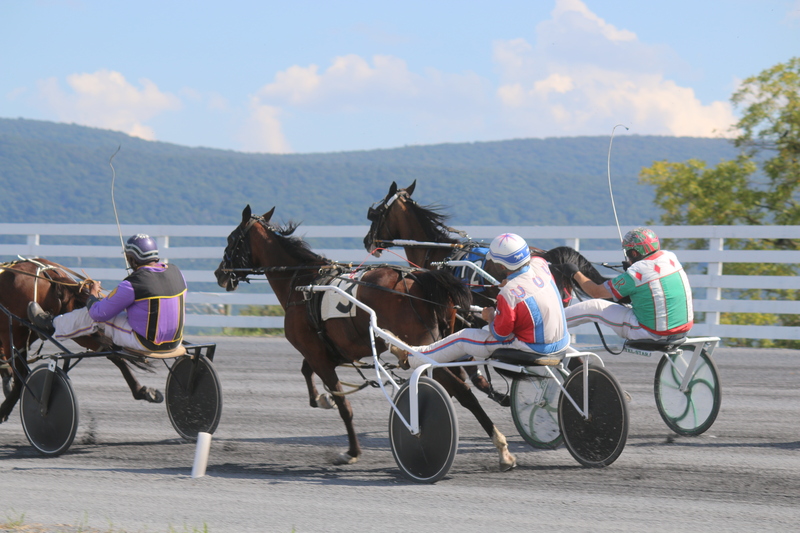 The second season of pari-mutuel harness racing at Shenandoah Downs is set to commence on Saturday September 16th and another five week season is planned. The meet will continue every Saturday and Sunday at 1 PM through October 15th. Gates open at 11 AM on race days. Pacers and trotters will compete in ten races each afternoon and a race generally goes off every 20 minutes. 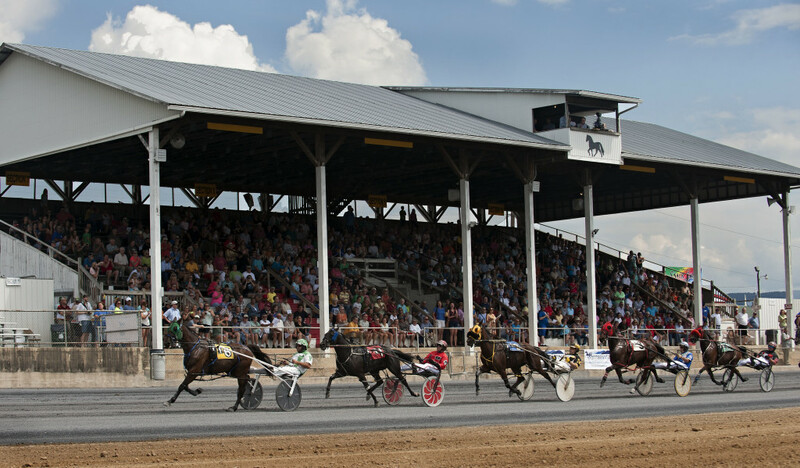 The half mile oval, which was completely renovated a year ago, recently played host to four days of Shenandoah County Fair harness races (non-betting). This was the 100th anniversary season of Fair racing at the grounds in Woodstock, which is located halfway between Winchester and Harrisonburg off I-81 at Exit 283. The scenery is second to none at Shenandoah Downs as pacers and trotter navigate a half mile oval. Photo by Andy Huffmyer. Featured event this meet is the Virginia Breeders Championship races for two and three year olds, which will take place during the first two weekends. Two year old finals are scheduled for Saturday September 16th while the three year old finals are set for Sunday September 24th. A total of eight divisional titles are up for grabs and over $300,000 (estimated) in purse monies will be awarded. The fall season will offer free parking and admission for fans every race day. Last year, there was a combination of paid and free admission days. Betting windows are conveniently located in the grandstand. Win, place, show, exacta and trifecta bets are available each race and can be placed with a teller or via a self bet terminal. 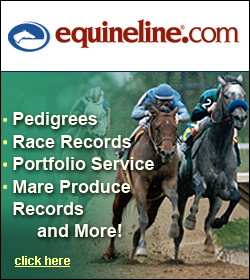 Programs that offer past performance information on all the horses can be purchased for $1.00. A free Tip Sheet will be provided with each program. Every Saturday will feature a different themed festival. Hops ‘n Hooves, a craft beer tasting event, kicks off the slate on September 16th followed by a Food Truck Festival on September 23rd. The popular Wine & Trotter Festival is on September 30th and features tastings from Shenandoah Valley wineries. Seafest, where various seafood related vendors are on premise, is on October 7th and Autumnfest highlights closing weekend on October 14th. The latter event is a heritage themed festival that includes a barbecue tasting competition with 40 contestants, live music, log splitting competitions and more. There are separate admission charges to access the Autumnfest, Wine & Trotter, and Hops ‘n Hooves sampling areas at Shenandoah Downs but general admission to the harness races is free each day. Details are at shenandoahdowns.com and virginiahorseracing.com.